Armstrong World Industries, incorporated in 1891, is an international designer and innovative manufacturer of ceilings and floors. The Lancaster-based global leader offers interior solutions to help enhance comfort, save time, improve building efficiency and overall performance, and create beautiful spaces. Armstrong wanted to renovate an existing display area, located inside their Avenues building, into a new client showroom. The goal was to create ways to thoughtfully display hundreds of flooring samples in an organized manner within a small space. Custom sliding display panels and horizontal pull-out drawers hold and showcase flooring samples. Three vignette areas highlight Armstrong’s major market segments: retail, healthcare, and education. Each is easily updated, as new products are introduced, without disturbing the existing flooring of the showroom. Finally, a black and white color palette is a neutral backdrop—bringing to life the flooring colors, finishes, and patterns it showcases. 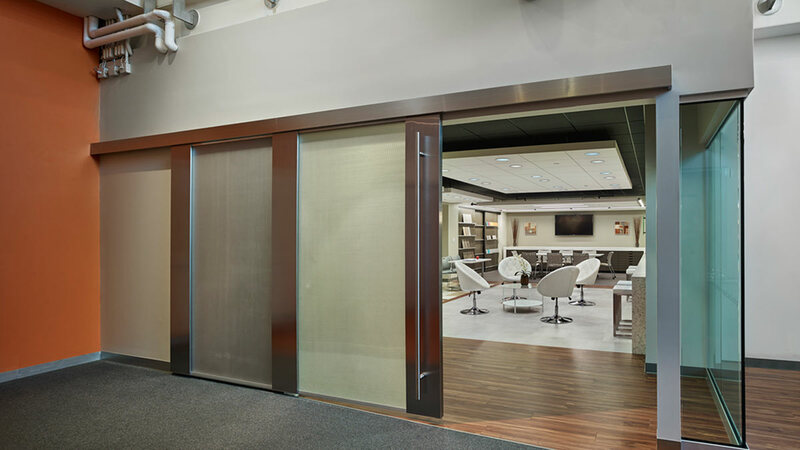 The renovated space now functions as Armstrong Flooring’s main showroom where clients can come to interact with larger size floor samples, colors, and product combinations in a comfortable and interactive environment. The clean, modern space highlights the flooring products which are displayed in a way that encourages engagement and exploration because of product accessibility and ease of use through visual and tactile demonstrations. As the first opportunity to showcase the turn-key project delivery capabilities of TONO Group for the flooring and ceilings leader, this successful project has led to an enduring working relationship with Armstrong. Having completed numerous additional campus improvements in recent years, TONO Group continues to provide its breadth of design, construction, and furnishings installation services to the global conglomerate.